Looking for a weekend getaway spot? We’ve found you this Airbnb in Udaipur that’s cosy, has a panoramic lake view, and costs less than INR 3,000 per night for two people. 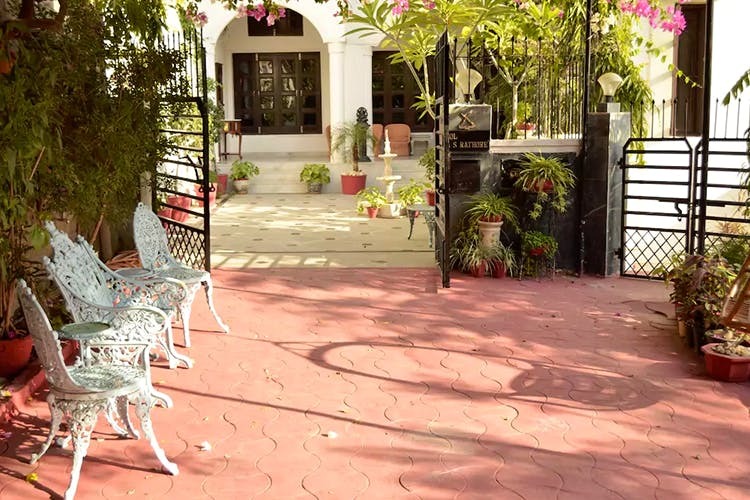 If you and bae have been wanting to get away from the city for a very long time, but things haven’t really materialised, this Udaipur BnB will convince you to make that trip. Ajit’s home—Chinarvilla—in Udaipur offers all the amenities that one would want in a vacay home. The property is located on a hill overlooking the old city and the famous Pichola lake. The best part is that all their rooms are facing the lake. Coming to the villa itself; It has huge windows with lots of natural light coming in, a beautiful green courtyard with wrought-iron chairs and tastefully decorated rooms in pastel colours that are not just spacious but cosy enough to make you want to stay at home all day. The guests are free to use the kitchen, the stunning drawing room and the garden. There’s Wi-Fi, TV, smoking is allowed and the hosts also offer free breakfast. In case you want to throw a party or organise an event, the owners are more than happy to discuss this prospect. We’d probably spend our days in their huge open balcony with a cup of chai, just admiring the city, the sunset or reading a book and playing UNO. You’ll be glad to know that all the tourist attractions, like Saheliyon ki Bari, Bagore ki Haveli, Monsoon Palace, Lake Pichola, City Palace and even the airport and railway station are less than 30 mins away from this property. You can also visit the restaurants in the neighbourhood, go crazy shopping for artisanal fabrics and souvenirs at the Hathi Pol Bazaar, be spellbound by the beauty of Jag Mandir Island (yes, where Katy Perry got married) or just enjoy chill, evening walks by the lake Ring Road. Check with Ajit once, and he'll be happy to help you with the itinerary too.